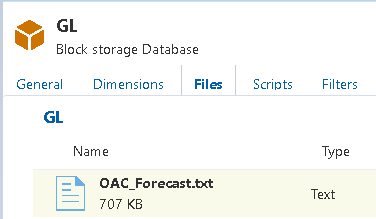 In the first part, I went through an example of extracting forecast data from PBCS using Data Management, downloading the data file and then loading this to an OAC Essbase database. All the steps in the example were manual, so in this post I am going to add some automation using REST APIs and scripting. I would recommend reading through the first post if you have not already, as I will be referring to it and this post will probably not make much sense unless you have read it. As always, I am going to stress this is not the only way to go about automating the process and is only to provide an idea as to what can be achieved. 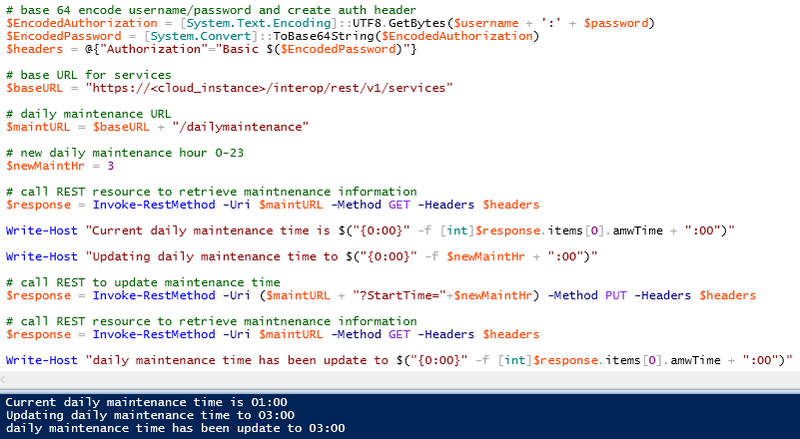 I will provide examples of the REST API using a free REST client and the scripting will be mainly with PowerShell, though you can achieve the same results with pretty much any scripting language. There will also be a little bit of Groovy thrown into the mix for those that are running a user managed version of OAC vs autonomous. 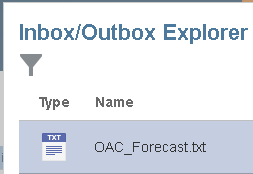 Extract Forecast year substitution variable from OAC Essbase. 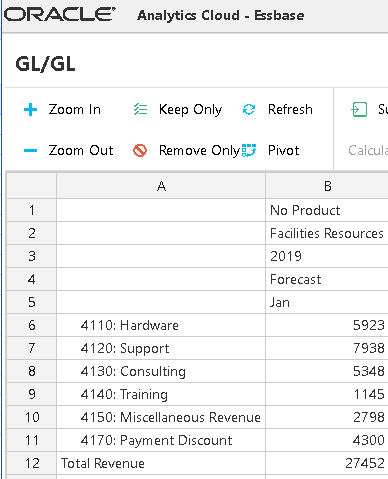 Transform variable into the start/end period for an EPM Cloud Data Management data load rule. 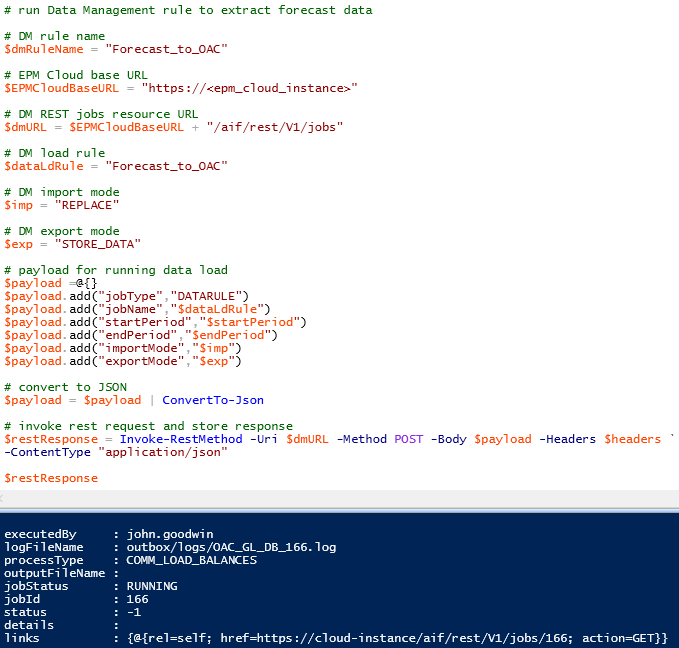 Run a Data Management data load rule to extract planning forecast data, map and then generate a file. 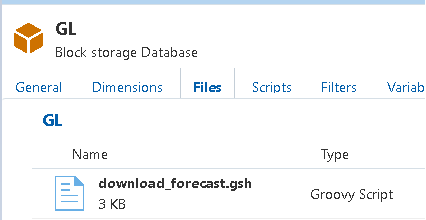 Download data file from Data Management (Groovy example, downloads directly from DM to OAC). 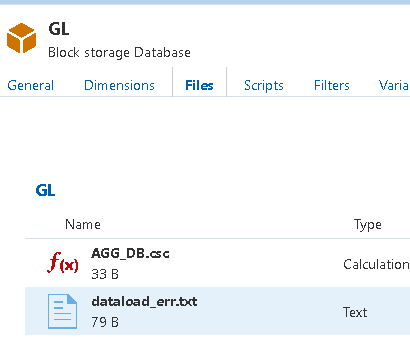 Run an Essbase Load rule to load data from file. It is possible to run the whole process directly from OAC using Groovy, but I am trying to provide options for autonomous OAC as well. 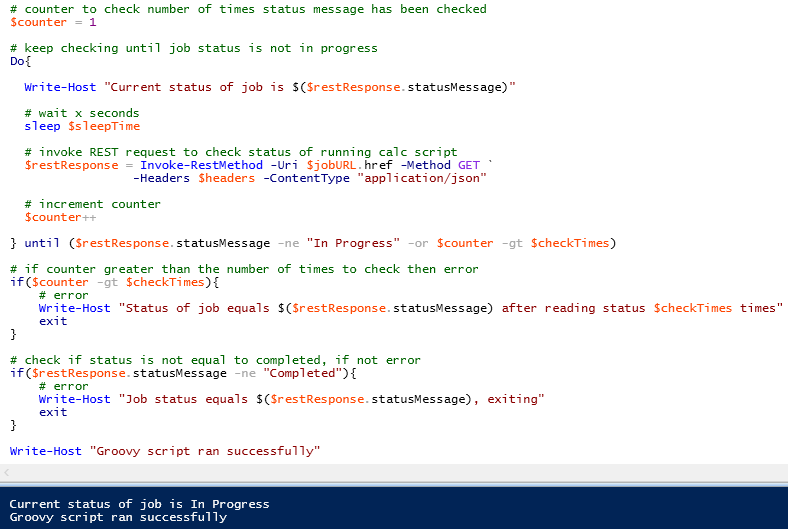 Also, I didn’t really want to show one big Groovy script because that is not very interesting for a blog post. Before I start out, it is worth pointing out that I going to be using the same forecast year sub var, Data Management and Essbase data load rule that I covered in the last post. 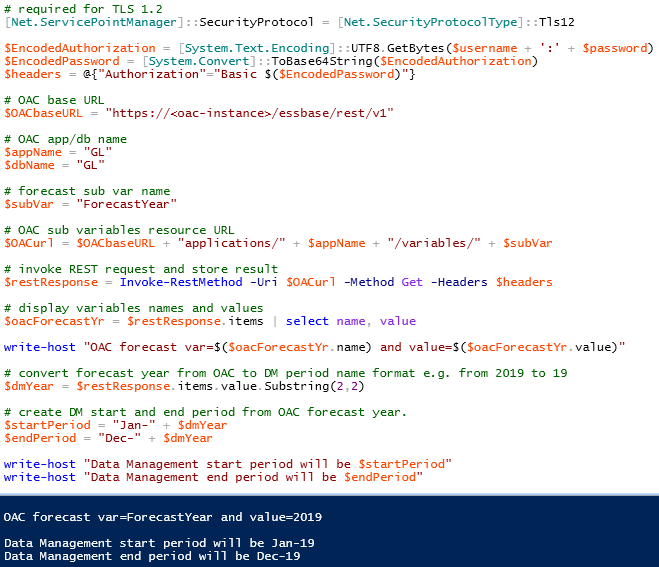 For the first part of the process, I want to extract the Essbase forecast sub var. This has been created at application level. The JSON response includes the name and value of the sub var. For Data Management I need to convert this to the start and end period. Now that the variable has been extracted and transformed, the Data Management load rule can be executed. 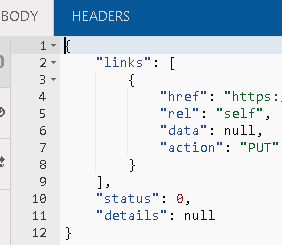 I have covered this in the past but to run a rule using the REST API, a POST method is required, and the body of the request should include the above values in JSON format. The response includes the job ID (process ID), current job status and a URL to keep checking the status. Time to convert this into a script which will execute the rule and store the response. 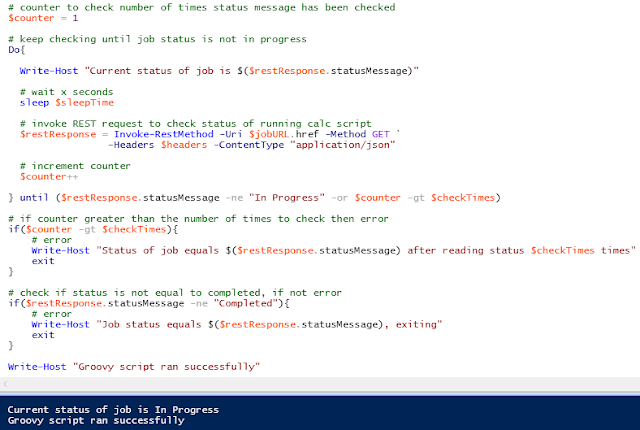 The rule has been executed and the response stored, now it is time to keep checking the status until it completes. In the Data Management target options of the rule, a static filename has been set. This means the file is available for download using the defined filename and from a location accessible using the REST API. A GET request can be made to the following URL format which includes the filename. 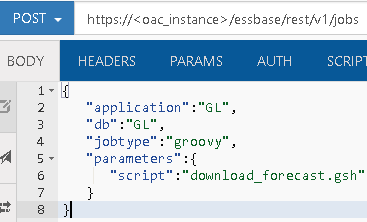 This is where my example splits: if you want to use a Groovy script and download directly to the OAC instance, this could be an option available to user managed OAC instances. The file will be available to load to OAC. There are a couple of options available, you could upload the file to the OAC instance and then run a data load rule or use the data load stream option. The streaming option allows you to run an Essbase data load rule but stream in the data, removing the requirement to upload the file first. 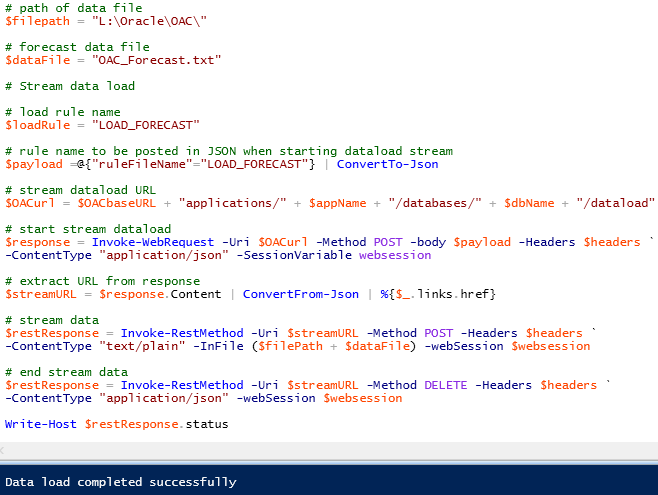 To stream data using the REST API you must use to a POST method to indicate you want to start a stream data load. The body of the post should include the Essbase load rule name. The response will include a URL to post the data to. The data can then be streamed using the returned URL. The response will include URLs to either stream more data or end the data load rule. To end the data load, a DELETE method is required to the same URL. If there were no errors, a successful message should be returned. If I update the data to include an invalid member and run the data load again. The response will indicate there were records rejected and the filename containing the errors. 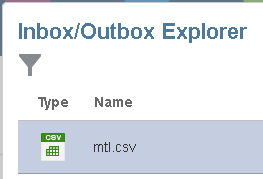 This file will be available in the Essbase database directory. This file could be downloaded using the REST API if required. I did have some fun trying to get the script to work as it needs to keep a web session active between the start and end of the streaming. I had to use “Invoke-WebRequest” where I generated a session variable and then used this in subsequent REST calls. If you are interested in what is happening behind the scenes with the data load streaming method, here is an excerpt from the Essbase application log. [DBNAME: GL] Parallel dataload enabled:  block prepare threads,  block write threads. If you don’t want to go down the streaming route, you could upload the file to the Essbase database directory using the REST API. This can simply be converted into a script. After uploading you can then run a load job which I will cover shortly. Going back to the Groovy option, which if available could be used to carry out all steps of the process to move data between EPM Cloud and OAC. 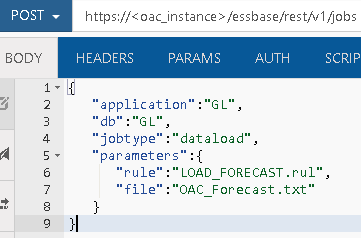 As an example, I am going to use it for downloading the data file from EPM Cloud directly to the Essbase database directory in OAC. 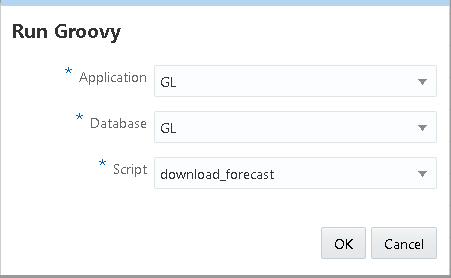 In the Groovy script, variables are defined such as the EPM Cloud URL for downloading files, the data filename, location in OAC to download the file to. 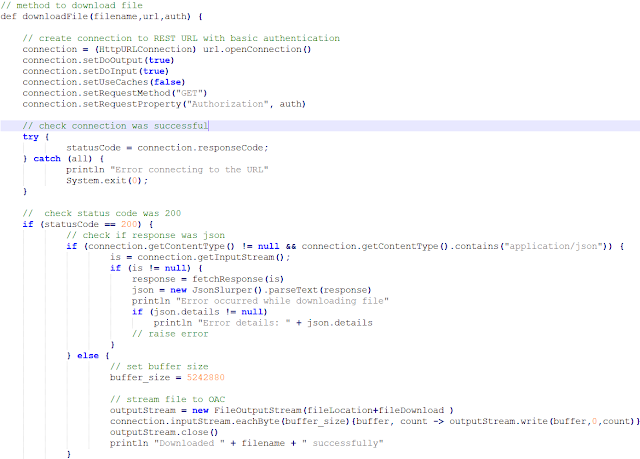 The user credentials are encrypted to create the basic authentication header for the REST call. A method is then called to make the REST request and download the file. The script should be saved with an extension of “gsh” and then uploaded to OAC. The script can be run from the jobs in the UI. 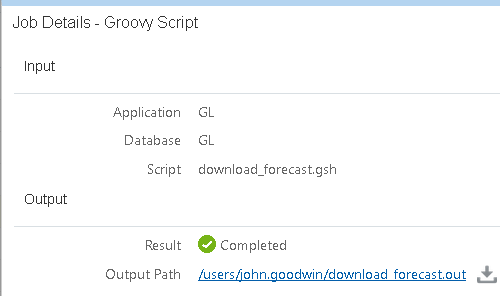 The application/database and script can then be selected and the Groovy will then be run. One of the disadvantages at the moment with Groovy in OAC is that parameters can not yet be passed into the script when running as a job. After running the job, an output file will be available that contains the output of the “println” method in the script. 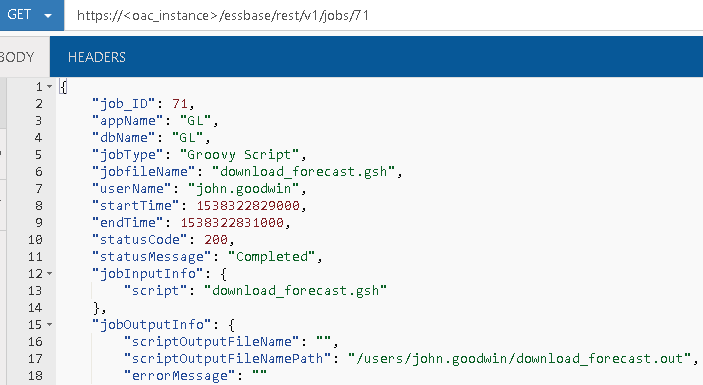 As this blog is all about automation we can run the Groovy script with the REST API. 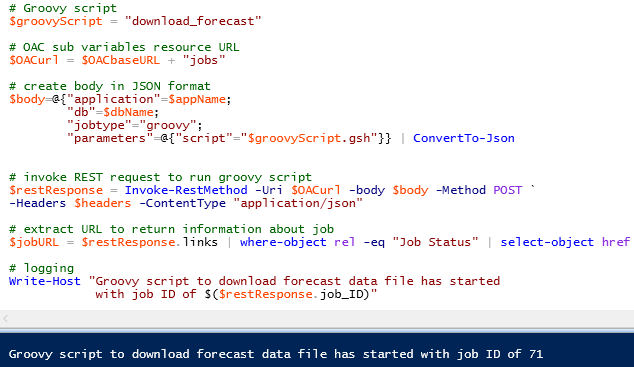 A POST method is required to the jobs URL, the Groovy job type and script to run is included in JSON format in the body of the post. The response includes detailed information about the job and a URL to keep checking the job status. 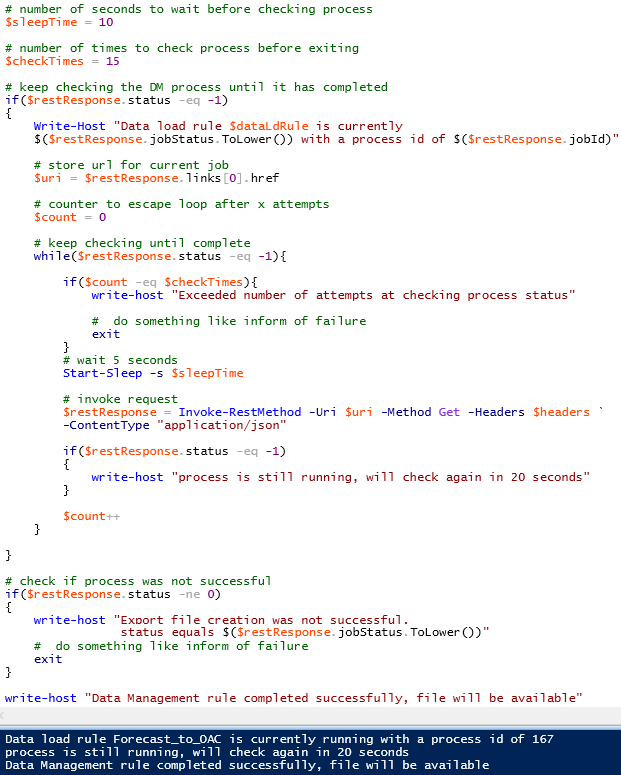 Once again this can be simply converted into a script to automate the process. With a GET method, the status of the job can be checked with the jobs URL that contains the job ID. 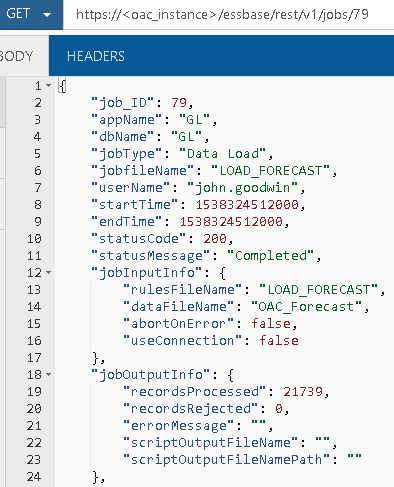 A script can automatically keep checking the job status, this is a similar concept to the earlier example when checking the status of a Data Management job. The file will have been downloaded directly from EPM Cloud to the Essbase database directory in OAC. 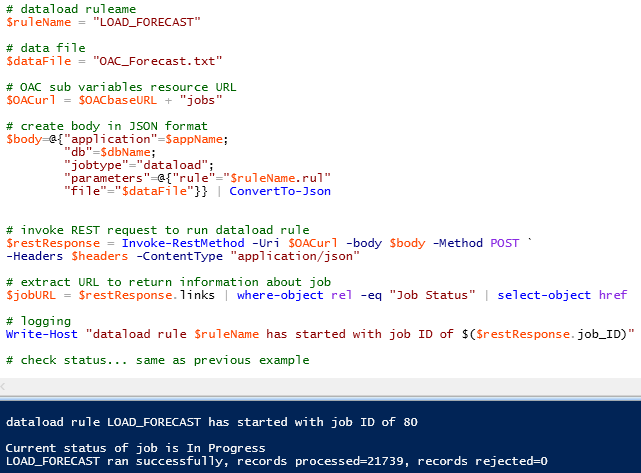 Finally, on to running the Essbase load rule to load the data contained in the file. 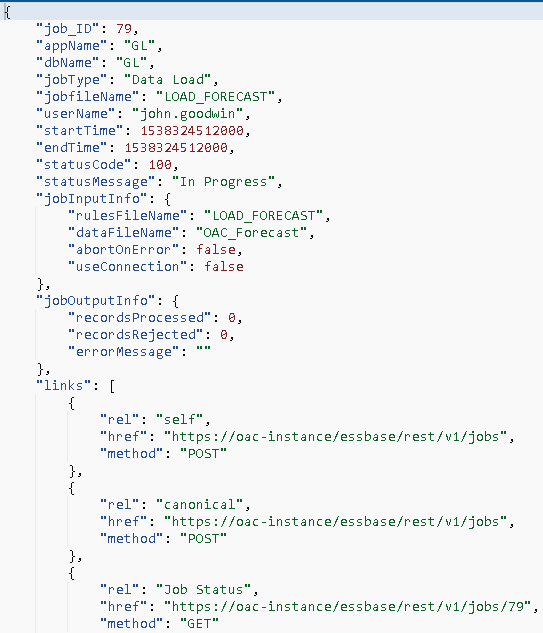 Using the REST API, it is the same call to the jobs URL. The only difference is the job type is “dataload” and parameters define the load rule and the data file. The information returned in the response is similar to running any type of job. The status of the job can be checked until it completes. The beauty of running a data load job compared to streaming data is that the response includes the number of records that were processed and rejected. This part of the process does not take much effort to convert into a script. 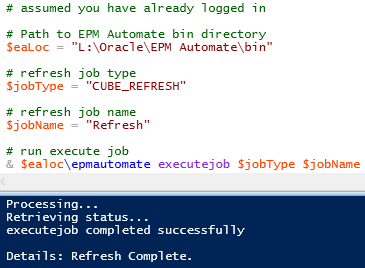 Now that the full process has been automated and run, the data from EPM cloud is available in OAC Essbase. 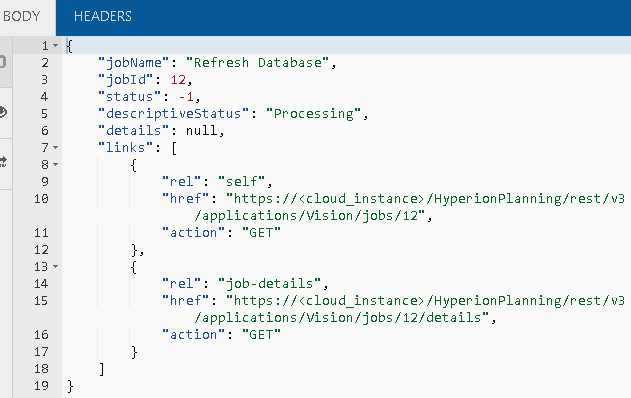 With scripting you can also automate the opposite process of extracting data from Essbase and then loading to EPM Cloud. Once a script is in place it can be reused across different data flows by just changing variables. If you are interested in understanding in more detail about how automation can help, please feel free to get in touch. 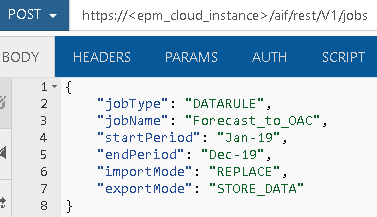 In the EPM Cloud 18.10 release there were a few additional commands added to the EPM Automate utility, these are also available through the REST API as the utility is built on top of the API. 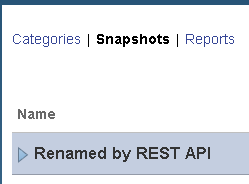 An annoyance for me with EPM Automate and the REST API has been not being able to rename a snapshot, even though it has always been possible through the web UI. 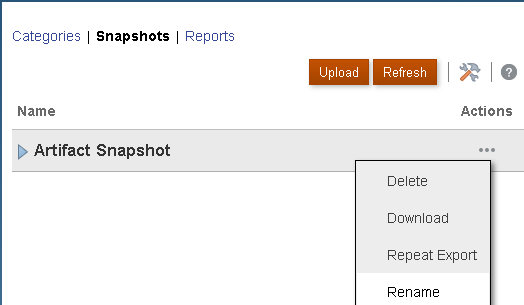 Not being able to rename out of the UI made it difficult to automate archiving the daily snapshot in the cloud instance before the next snapshot overwrote the previous one. You could download, rename and upload but this over complicates what should have been a simple rename. 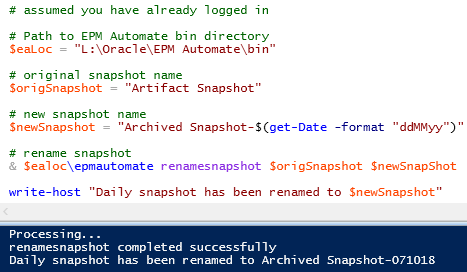 With the 18.10 release it is now possible to rename a snapshot with a new EPM Automate command. 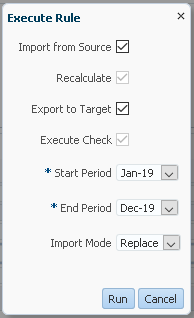 Using EPM Automate and a script, it is simple to rename the snapshot, in the following example the daily snapshot is renamed to include the current date. This means the snapshot is now archived and the next daily maintenance will not overwrite it. Please note though, there is a retention period for snapshots which currently stands at 60 days and a default maximum storage size of 150GB. If this is exceeded then snapshots are removed, oldest first to bring the size back to 150GB. The documentation does not yet provide details on how to rename a snapshot using the REST API, but I am sure it will be updated in the near future. If the rename is successful, a status of 0 will be returned. In the UI you will see the snapshot has been renamed. If the rename was not successful, a status that is not equal to 0 will be returned and an error message will be available in the details parameter. The functionality will only rename snapshots and does not work on other file types. 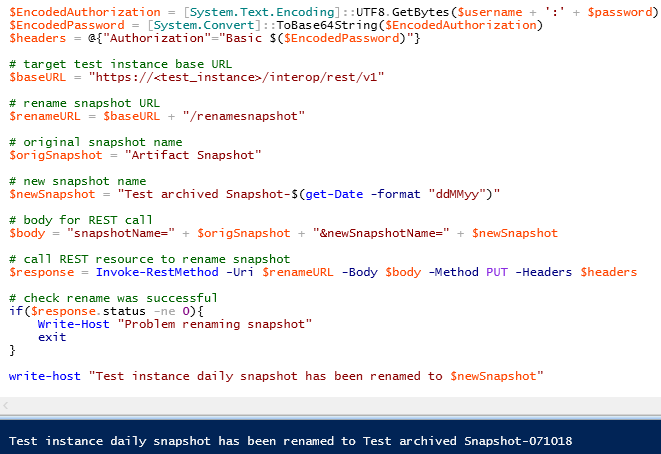 It is an easy task to script the renaming of a snapshot using the REST API. 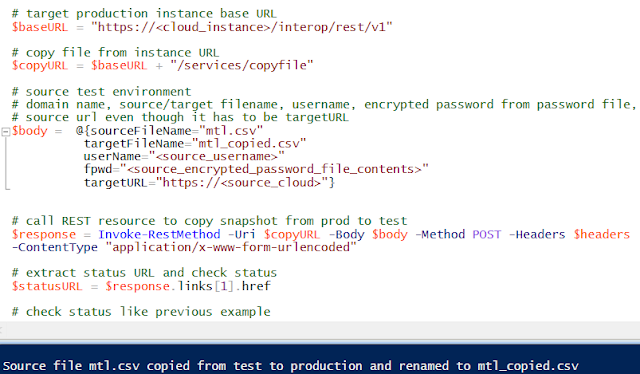 In the following example I am going to log into a test instance and rename the daily snapshot, then copy the daily snapshot from the production instance to the test instance. 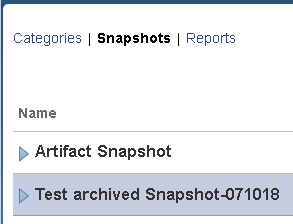 This means the production application is ready to be restored to the test environment if needed, also the test daily snapshot has been archived. 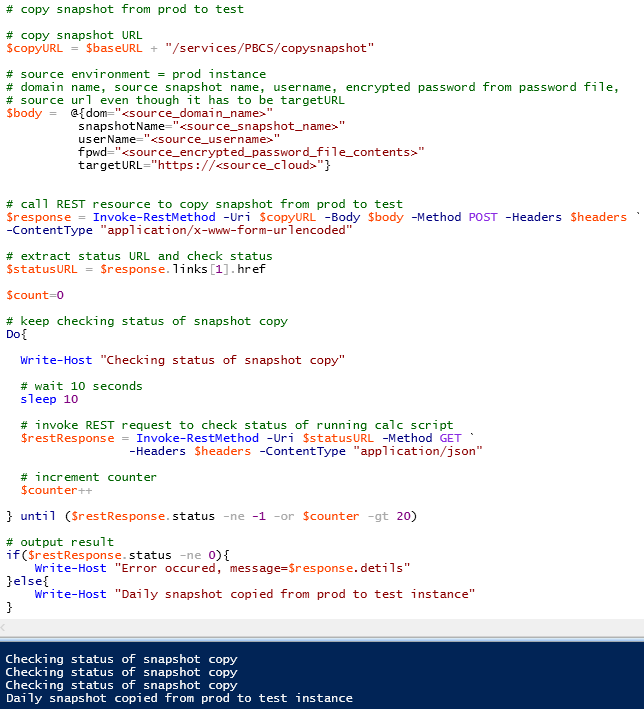 The above section of the script renames the test snapshot, the next section copies the production snapshot to the test instance. When calling the REST API to copy a snapshot, a URL is returned which allows you keep checking the status of the copy until it completes. Now in the test instance, the daily snapshot has been archived and contains a copy of the production snapshot. To achieve this using the REST API is very similar to my previous copy snapshot example. Say I wanted to copy a file from the test instance to the production one and rename the file. 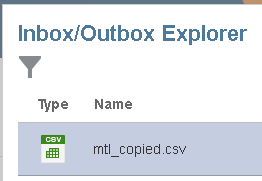 The file has been copied to the production instance and renamed. This was subsequently removed from the document, but the command does exist in the utility. The command just looks to bypass having to use different commands to run jobs, so instead of having to use commands such as “refreshcube”,”runbusinessrule” or “runplantypemap” you can just run “executejob” with the correct job type and name. 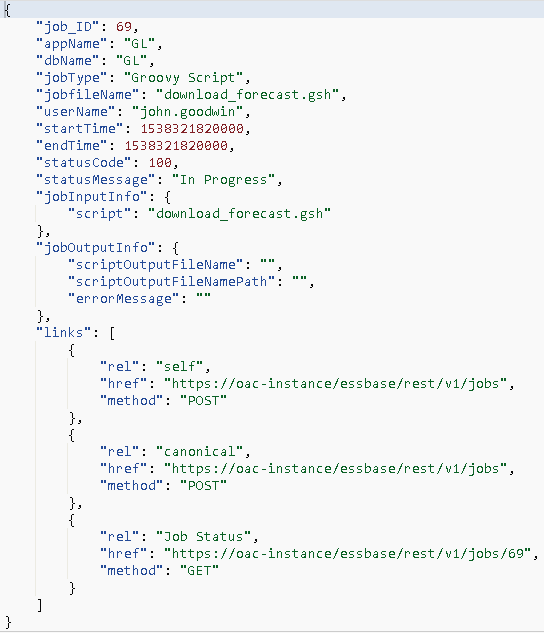 The command is really replicating what has already been available in the REST API for running jobs. I am not going to go into detail about the REST API as I have already covered it previously. The response will include details of the job and a URL that can be used to keep checking the status. I was really hoping that the functionality was going to allow any job that is available through the scheduler to be run, for instance “Restructure Cube” or “Administration Mode” but it looks like it is only for jobs that can be created. Hopefully that is one for the future. 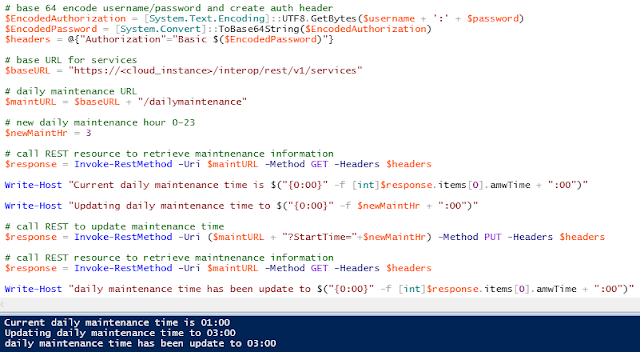 In 18.05 release a new EPM Automate command appeared called “runDailyMaintenance” which allows you to run the daily maintenance process without having to wait for the maintenance window. This is useful if new patches are available and you don’t want to wait to apply them. In 18.10 release the command includes a new parameter which provides the functionality to skip the next daily maintenance process. 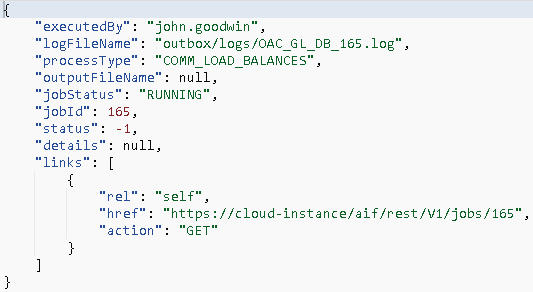 The REST API documentation does not currently have information on the command but as the EPM Automate utility is built on top of the API, the functionality is available. The format requires a POST method and the body of the post to include the skipNext parameter. The response will include a URL to check the status of the maintenance process. When the process has completed, a status of 0 will be returned. 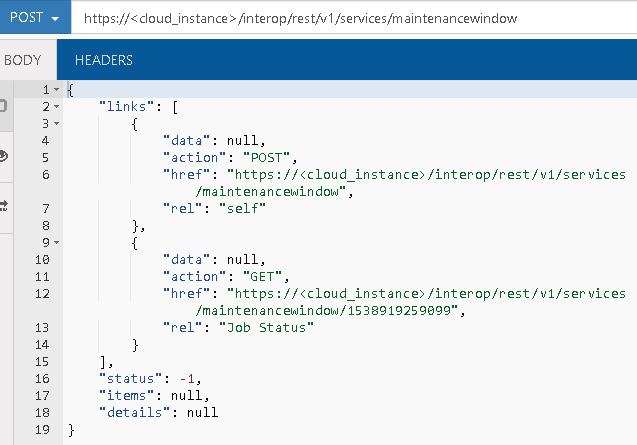 It is worth pointing out that as part of the maintenance steps, the web application service is restarted so you will not be able to connect to the REST API to check the status while this is happening. Another piece of functionality which has been available through the REST API for a long time, but not EPM Automate, is the ability to return or set the maintenance window time. The “amwTime” (Automated Maintenance Window Time) is the scheduled hour for the maintenance process, so it will be between 0 and 23. If the update was successful a status of 0 will be returned. You can then check the maintenance time has been updated. I did notice a problem, even though the REST API is setting the time, it is not being reflected in the UI.